DC Direct has posted their newest additions for March 2010. 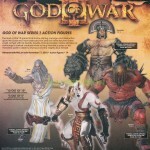 Included are the new Blackest Night figures, Jonah Hex figures and statues, as well as the first info on their upcoming God of War figures. We have mirrored the photos. You can check out over 30 images by clicking the headline of the story. Sideshow Collectibles has put up pre-orders for three new Disney themed statues. First up is Mickey Mouse as the Sorcerer’s Apprentice from Fantasia. Also added was Hades from the animated film Hercules. And finally there is Jafar from the modern classic Aladdin. Both villain statues should be available within the next two weeks, while Mickey will be available in June. Sideshow Collectibles proudly presents the Walt Disney Classics Collection. Based on original film reference, these Walt Disney Classics Collection statues are hand-crafted of fine kiln-fired hand-painted porcelain. Commemorating the 10 year anniversary of the ‘Hercules’ film release, the Hades Statue stands approximately 11 inches high. Talk about your hot heads – the cunning and comical villain Hades triumphantly gloats about his presumed victory over the virtuous Hercules. The statue includes a gift box and Disney Certificate of Authenticity imprinted with the signatures of Disney Master Artist and Creative Director David Pacheco and Disney Archives Director Dave Smith. Sideshow Collectibles proudly presents the Walt Disney Classics Collection. Based on original film reference, these Walt Disney Classics Collection statues are hand-crafted of fine kiln-fired hand-painted porcelain. Duplicitous Jafar, the sly and calculating villain from Disney’s animated film Aladdin, will add a touch of treachery to your collection. Perched atop his shoulder is his mimicking parrot, Iago. 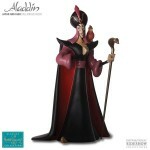 This Walt Disney Classics Collection statue hand-crafted of fine kiln-fired hand-painted porcelain features a ruby, pewter plumes, arms, face. Jafar stands 10″ high. With production limited to the year 2006, there are only a few pieces remaining in the edition. The statue includes a gift box and Disney Certificate of Authenticity imprinted with the signatures of Disney Master Artist and Creative Director David Pacheco and Disney Archives Director Dave Smith. You can see images of these famous Disney Characters by clicking the headline of the story.